July 11, 2017 is an important day in the Hebrew Scriptures and calendar, called “the fast of the fourth month” in Zech. 8:19. On this day, Tammuz 17, in both 586 BC and 70 AD, foreign armies breached the walls of Jerusalem. This led quickly to the city’s tragic fall and exile of the Jews. (2 Kings 25:3-4) What are the implications for followers of Yeshua today? Tammuz 17 launches a period of three weeks, ending on Av 9, called “Bein Hametzarim.” This translates in English to Between the Narrow Places or Between the Straits. The period is sometimes also called Dire Straits or Narrow Straits. (The name derives from Lamentations 1:3 in the original Hebrew.) Many terrible disasters have befallen Israel and the Jews during Bein Hametzarim through the millennia. 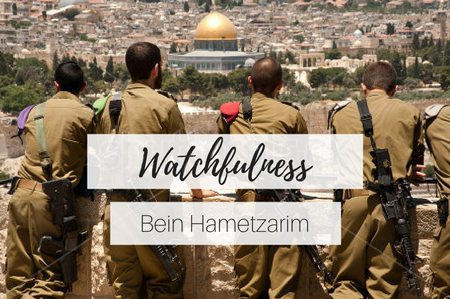 Spiritual and natural warfare often seems to intensify, especially—but not exclusively—toward Israel. Observant Jews fast today and at the end of the period on Av 9, mourning the whole time in between. Therefore, this is a sober season of reflection and realignment with YHVH. For those who follow Yeshua, this is an hour of increased watchfulness and intercessory prayer. We are sober and alert, yet encouraged in Him. Here are three keys to help you navigate Between the Straits fruitfully by the Holy Spirit: (1) Realign your heart, mind and will with YHVH, so the enemy can not take undue advantage of your weak areas or unrepentant sin. Then walk confidently in Messiah’s holiness by the power of His grace. (2) Intentionally worship and joyfully exalt the Lord. Daily declare the sovereignty and supremacy of YHVH over all that concerns you, Israel and her enemies. (3) Be faithful to your call as a watchman or woman on the walls of Jerusalem. Pray protection over Israel’s restoration. For help in learning how to pray with wisdom for Israel at this and other times, check out our Prayer Guide for Israel at lightofzion.org/prayer/guide.